So, you can just about imagine, I am overjoyed. Christmas came early for me this year. It’s here. My cover is here! The Christmas Tree Guy is becoming more and more real every day and this is the most exciting thing I think that’s happened to me in life. I’m so happy to be able to share this with you. First of all, Viola Estrella, is a genius. She’s the brains and creativity behind this beautiful cover and I couldn’t be any happier to be associated with her and the publishing team at 5 Prince Publishing. Thanks to everyone that’s had a part in making my dream come true. I hope you’ll enjoy the story just as much as I’m loving the cover. You can’t put a color on love. Between juggling rambunctious twin five-year olds, buying a Christmas tree, and getting home to put her feet up, thirty-four year old Sydnee Garrett doesn’t have time for nonsense. She’s disgusted with the idea of happily ever after since her husband walked out on her for a much younger woman, and she just wants to get through the holidays with no fuss. 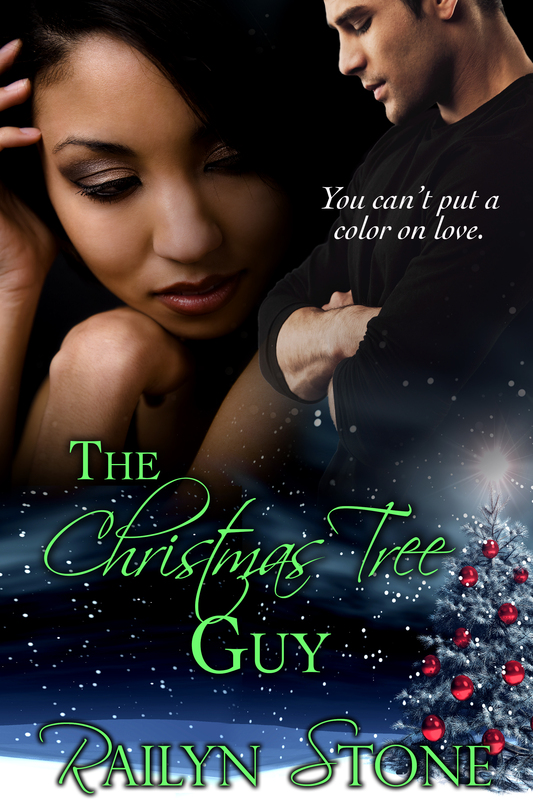 Fortunately, her ideas are discarded when a visit to the local tree lot the day after Thanksgiving not only leads to the purchase of the perfect tree, but an unexpected romance with a man eight years her junior, who just happens to be white. What starts as ‘just having fun’ quickly turns into something more serious, and it seems everyone, from her best friend to her mother, has their own opinion about how she should live her life. Just when she didn’t think things could get more interesting, her ex-husband returns professing his love, and Sydnee’s life goes from simple to complicated in a matter of seconds. Quinn Masters doesn’t take no for an answer, and once he finally gets Sydnee to say yes to his advances, he does everything in his power to make her see they belong together. The twenty-six year old personal trainer isn’t fazed by the age or race difference between the two. He only hopes Sydnee can finally ignore what people are saying and give their relationship a chance. Oh wow! This is beautiful and I am so overjoyed for you. Elle, you are too sweet. Thank you so much. I’m still amazed at how awesome a year it’s been for both of us. Keep up the good work.